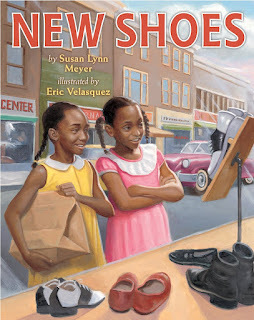 I happened to read Can I Touch Your Hair by Irene Latham and Charles Waters shortly after reading New Shoes by Susan Lynn Meyer. Both books are written from a first person point of view (in Can I Touch Your Hair, two first persons’ points of view). They tackle the tough topic of race in a way that children can relate. New Shoes is the story of Ella Mae buying new shoes with her mother in the 1950s. Living in the Jim Crow era, she experiences discrimination and finds a way to do something positive, treating other black community members with respect and dignity. The story in Can I Touch Your Hair? is set in today’s time. It is made up of alternating poems written by two fifth grade characters, a white girl and a black boy. They describe their experience of being paired to work on a class project. Slowly, these two characters form a friendship, coming to know, understand, and appreciate each other. New Shoes lets us look at a bright spot in a dark era, and the courage and self-respect these black characters maintained for themselves. We get only a glimpse of the character Mr. Johnson’s, the white owner of the shoe store, fixed in time. I can imagine reading this to an older child today, and the child asking why the characters acted the way they did. Meyer provides an explanation in back matter. In Can I Touch Your Hair?, the black and white characters are given time to get to know each other and change their views. Revealing history and current events are written into a some of the poems. What is the difference between the two time periods that shaped both of these stories? 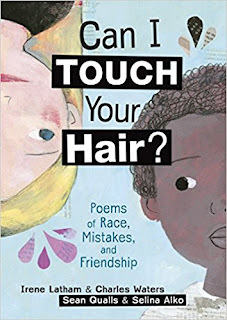 The teacher in me sees a wonderful opportunity to trace the sensitive subject of race in this country’s history through such picture books as Henry’s Freedom Box by Ellen Levine, Pink and Say by Patricia Polacco, New Shoes, The Story of Ruby Bridges by Robert Coles, and bring it into today’s time with Can I Touch Your Hair?. While there are stories about tough issues I would not write about because they are not my stories to write, the writer in me thinks it Is not necessary to shy away from stories about other tough issues. I need to explore them through a child’s point of view, with experiences today’s children can relate to, and to take a long view of history. I’m Gail Hartman. Since second grade, I have wanted to be a writer. As a former special education teacher, I fell in love with picture books during a children’s literature course. My published books include For Strawberry Jam or Fireflies, For Sand Castles or Seashells, As the Crow Flies, and As the Roadrunner Runs, all with Bradbury Press. 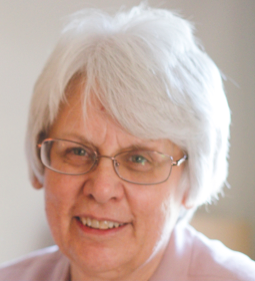 After writing, I went back into education as a school librarian assistant and then again as a special education teacher, falling in love with many picture books and students along the way. I have now retired from teaching, and I am an overjoyed grandma! I am loving my return to reading, researching, and writing picture books. It thrills me when someone I meet has read one of my picture books, and they tell me that they loved it! As the Crow Flies is still in print after 27 years. I love the idea of using a range of books to feature an issue that spans a long period of time. And your example is quite timely. Thank you for this thoughtful post! And congrats on having a written a book with staying power, no small feat!! I also love the idea of using multiple books to get at the same (or similar) issue in different ways and across time! I'm going to have to read Can I Touch Your Hair now! Thank you for the great recommendation! A timeline of history through picture books - such a great idea! Wonderful references. Looking forward to reading your books. I love the pairing of these two picture books & the suggestion of reading a timeline of picture books to explore difficult issues, like race. We need these books, don't we? Great resources and discussion starting points. Thanks and congratulations!!! 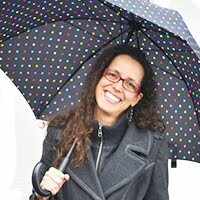 How great it is to read your timely post and see your smiling face here, Gail! Thank you, Gail, for this inspiring post. Great advice, share stories about tough topics from the child's point of view. You shared excellent mentor texts. Thanks Gail!